I had not expected to hear the phrase 'tolerating air' this week: surely air is just to be breathed and not something to be tolerated? But indeed the hospital doctor cited it as a goal for Tess after she was admitted to A&E and kept overnight with asthma. It was all quite sad and scary because she had to have nebulisers and oxygen tubes up her nose - she hated the discomfort of those - and generally, she cried her way through 2am, 3am, 4am and beyond. We got less than 2 hours sleep in 24. It was only the next day that she was able to 'tolerate air'. I can't help feeling sad. Apparently something like 20% of children in the UK have asthma. The air pollution we blindly create - driving short distances, using perfumey bathroom cleaners etc, is just so endemic people forget to question it. It makes me have the odd wistful pang for country living - or at least for less traffic in Glasgow. Anyway, Tess is on the various medications now and I am just trying to absorb it all. I love how her sense of humour managed to poke through her misery in hospital. She said daddy was late for visiting hour because Invisible Monkey The Great (her imaginary monkey) was driving him and had to strap him in the booster seat in the back of the car. I'm so glad to be home again. 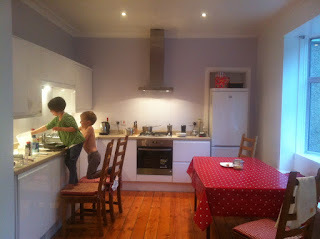 Here they are playing in the new kitchen. Glad she is out and well. Having your child in the hospital is a harrowing experience.